Printmaking without a press using the new GelliArts Gelli Plate has really taken the interest of the arts & crafts world. You can buy a plate or now simply make one! Sizes: Rectangular: 6×6 ($19.99) 8×10 ($29.99) 12×14 ($69.99) Round: 8″ ($27.99) Many more sizes and shapes are now available. The “gelatin” plate revolution started with homemade gelatin plates using gelatin and water, but they last only a few weeks and must be refrigerated. However, they can be reconstituted by heating and repouring. For a more “permanent” gelatin plate, various artists have experimented with adding glycerin to the mix. You can use a rectangular glass pan, one of those clear acrylic frames, or a metal pan or tray. You can also make plates in round shapes or cut fresh ones into geometric shapes or organic forms. If the pan is 9×13, the plate will come out about 1/4 inch thick. Adjust the recipe for larger or smaller sizes or thicker results. Thicker plates are less likely to tear. First, mix the gelatin and glycerin together thoroughly in a heat-safe container, then added boiling water and stir slowly. Try not to introduce air into the mix. Alternative: Start with the cold water and 1 bottle of glycerin; stir gently and add glycerin; stir thoroughly and add hot water; stir gently and add remaining glycerin. Pour the hot melted mixture into a pan — make sure first that everything is level in your setup. Skim the top with a strip of newspaper to remove air bubbles. Let it set. You can also refrigerate the mix until set (a few hours) or put in the freezer for 15-20 minutes. Or just leave it on the counter to cure, since it’s best not to move it until it’s firmer. To remove the plate from the pan, use your fingers to go around working the gel back from from the edges. After you break that seal, you should be able to peel it from the pan and move it onto a plexiglas plate or whatever you will use as a printing surface. Note: a clear surface lets you place designs underneath to work with — or a paper so that you can gauge pulling prints better. After curing, if your result is still a little sticky or malformed, you can microwave it (in a glass container) for 3-4 minutes to liquify it, stir it when needed. Then pour it, and let it set again. Sometimes it needs more or less water. The paint should roll on smoothly, although the very first paint application may not be smooth. You can also redo the melting and resetting if it tears (or just cut it down). In contrast to the gelatin only plate, the gelatin/glycerin plate doesn’t need refrigeration. But it isn’t as permanent as a real Gelli Arts Gelli Plate since it is more fragile and will tear easily, especially if it is thin. You also can’t wash it under the faucet like the tougher plate. You can clean it by spraying with water and wiping with paper towels, or by using baby wipes. Otherwise printmaking is just the same. After experimenting with acrylic and watercolor, the results are indistinguishable. But I think the homemade plate is slightly “friendlier” to watercolor because the Gelli Arts Plate has mineral oil in it and the homemade version has water. I keep and use mine is a plastic box. But you can store yours on a plexiglas plate. Just be sure to use a piece of plastic on top or plastic wrap around it to protect it, especially from evaporation of the water contained in the plate. If it hardens, just reconstitute it as mentioned above. You might have to add a tablespoon or two of water. After some experimentation, I pour mine directly into the plastic box. Thanks for both recipes, Sharon. I made a plate with the first recipe, and it is rather thin, as you say. I have tried to find a slightly smaller, more “squared corner” pan to make another plate, but so far am unsuccessful. My current plate is in the baking pan I cured it in with its own plastic lid. If you should come across a source for a smaller pan, I’d love for you to share it with me! 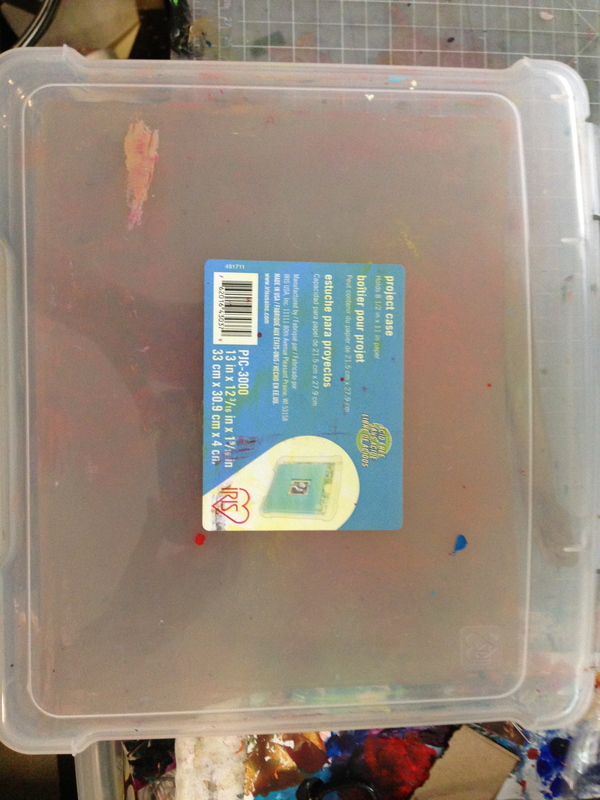 Some artists use the old acrylic clear box frames. You can still buy them online. I made a recipe for a 9×14 pan which comes out perfect… but after the first set up, you may have to cut it up and melt it down and pour again for a perfect glass like surface, ive noticed that the 2nd melt down is key to getting a perfect surface for some reason… here is a link to my youtube video with my recipe for my 9×14 pan gelli plate… if you dont want to use alcohol, then replace it with more of the glycerine. I want to see your next video using the gelli plate but I do not know your web site and didn’t get your email address at the end. Thanks. I haven’t created any videos yet – those are other artists’ videos that I refer you to. You might want to update your article – Amazon has a variety of sizes of Gelli plates available now. Thanks, Lisa, I will do so. I’d like the new stamping size shapes. Use vegetarian gelatine my gellie plates are still perfect after 2.5 years stored just in a cupboard between some sheets of acetate and a plastic bag. Very interesting. Where do you purchase vegetarian gelatin? And do you add glycerin? I get vegetable glycerin at health food stores and the Vitamin Shoppe. It can also be found in hair care with Afro/curly hair products. Sometimes it’s with natural products or in drug stores with specialty Hispanic brands, like De La Cruz. But, for large amounts, it might be easier to order online. -I’m going to be looking for vegetable gelatin next. I am wondering if there is a form of very permanent epoxy art like the gelatin art, but would be used to create a desk? 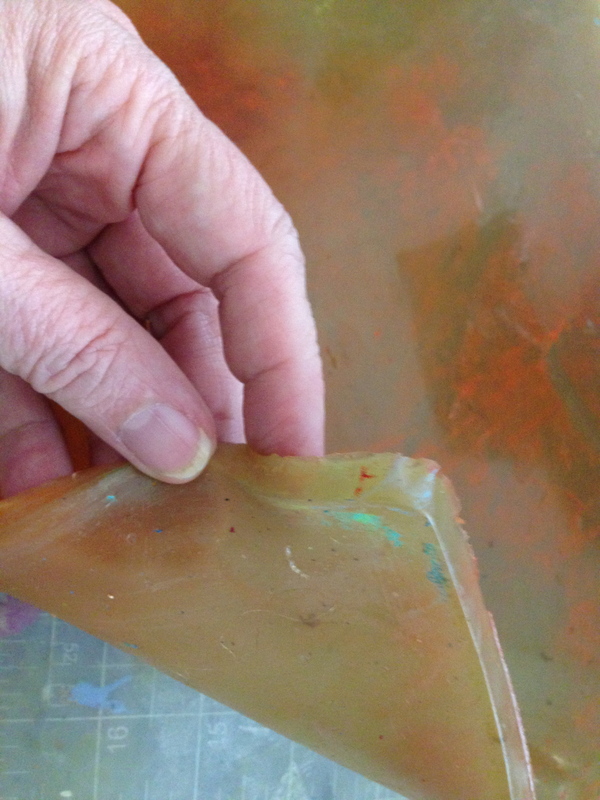 Since the paint used with the gelatin or gelli plate is usually acrylic, you could just use epoxy to cover the print. I don’t really know of an all-in-one. Yes, heating on the stove works also. Do you think it would be ok to cure my own gelli plate in a ceramic dish? Yes, you can pour into a ceramics dish – almost anything nonporous will work. The recipe calls for 1/2 cup cold water, but never (unless I missed it) told me when or how to add it? Thanks! Looking forward to using this. 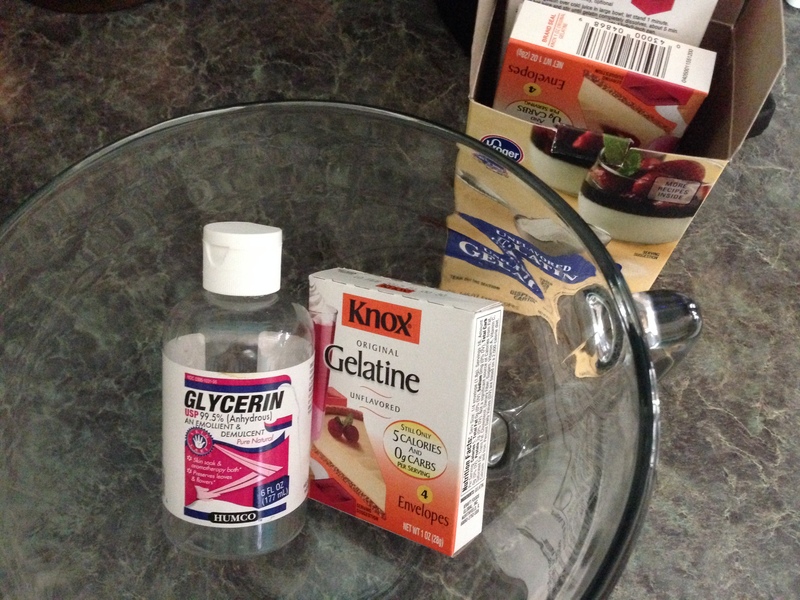 It’s in the recipe section (the alternative method – mix cold water and glycerin, then add hot water and gelatin). I made my gelli plate and is ok, the only problem is that my acryilcs dry too fast, any suggestion? Two ways to resolve drying too fast — add acrylic medium to the paint before rolling it. That will add a couple of minutes grace. If you need more, use an open or extender medium. Another way is to use a mister. Especially right before you pull a ghost print. How soon after making the gelli plate can I use it? If you refrigerate it, only about an hour or so. At room temperature, give it at least two hours before checking to see if it’s finished gelling for decanting. If you make it in the container you’re going to keep it in, you won’t have to decant it and risk tearing it. I use 9×12 clear trapper keepers with lids. How do you repair a ripped homemade geli plate? To repair a homemade gel plate: first rip it up, then put it in a glass container, and microwave it for three or four minutes or so until the pieces are melted, stirring if needed. You might want to add a tablespoon of water if it seems thick, since water will evaporate out of the plate. Then pour back into plate container or mold. Will these plates work with intaglio inks? I just got some Akua inks, which are great because they have a long open time. Yes, they will work with the Akua inks and the graphic printing inks. Be sure to clean up with baby wipes since the ink won’t dry. You will get best results on absorbent paper. I tried printing on yupo with Akua and it took a year for it to dry. I haven’t tried it but almost anything with a nonporous surface can be used for printmaking, some with good results. A hot/cold pack surface might be a little uneven. I wonder if you have had a similar experience to me? I’ve made the diy version with the glycerin, gelatin and water but find the finished set plate to get stickier the more times i use it. (I’ve followed Lindsay’s the frugal crafter updated recipe on youtube). The brayer ends up sticky too. I’ve remelted and tried again a few times but always ends up the same. It ends up that sticky that the acrylic paint pulls off the plate and sticks onto the brayer when i try to spread it around. It is very frustrating and I am trying to find a solution that doesn’t involve me scrapping it and buying a genuine gelli plate. Any advice or suggestions would be greatly appreciated from you or any of your readers. Thanks so much. Did you try adding water when you remelt it? Sounds like the opposite of what you would want to do, but it’s what I do. Great recipe! thank you for sharing. I made quite a few for my classroom, however I am finding that they mold easily. Any recommendations for that? Do you keep your plates in covered containers? I haven’t had any trouble after several years and much use. My suggestion is to try remelting and add a little more glycerin and water (after you scrape the mold off). It’s the gelatin component that molds.